Garak and Bashir investigate the mystery of Cardassian children who were left on Bajor after the occupation. I'm so happy to see Garak again. He is my favorite guest character from the first season, and it's a good thing the writers didn't abandon him. This is the first episode that makes Bashir an interesting character, in my opinion. His boyish enthusiasm is transformed by Garak into a wonderful inquisitive streak, as though Garak is molding him into a detective or a spy. The fact that he boldly interrupts a conversation between Sisko and Dukat (twice) shows that he is capable of getting swept away by his own need to solve the puzzle. Why was Sisko talking to Dukat from the bridge in the first place? Wouldn't that be the kind of conversation he'd have in his ready room? 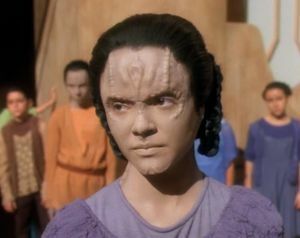 I'm glad the writers are dealing with the racist streak in O'Brien that we've seen before. It's important to let O'Brien work that out, and using his parental sympathy with Pa'Dar is a great way to begin the healing process. There's a subtle reference to political repercussions following the three episode story arc that started the season. Garak always gets some great lines: "I believe in coincidences. Coincidences happen every day. I don't trust coincidences." "I never tell the truth, because I don't believe that there is such a thing." I love this episode (though I think the title is way too general). It is deeply complex--it's pretty damn difficult to sort out what's going on--and it deals out a moral quagmire that turns all your assumptions and prejudices on their head. It isn't afraid to confront really difficult subject matter, like parenting, racism, cross-border custody disputes, post-WWII attitudes towards Germans and the Japanese, and much more, and it does it in an entertaining way through Garak and Bashir. TOS and TNG tried to deal with some of these issues separately, but nothing ever came close to the moral maturity, complexity, and ambiguity on display here. The writing is absolutely ingenious, and it reveals a downright sociopathic side to Dukat that makes him a more frightening recurring character. Does Garak know Bashir's secret? Is that why he befriends him and utilizes him? If there's one man who could figure it out before the big reveal, it's Garak.